We all are concerned about our security while browsing internet. While browsing you may have noticed that some sites are secured as HTTPS while most of them are not protected with such security and run with HTTP connections. Most of the web hosting servers use HTTPS for secure shopping and banking web sites while other pages are not encrypted enough to improve privacy and security of users. Today I’ll tell you about a free software called HTTPS Everywhere which can encrypt almost every web site that you visit through your browser. HTTPS Everywhere is a free browser extension that can be installed to ensure that a secure connection is used whenever available. Generally a large number of web sites offer encrypted HTTPS connections, but by default it will send you through the regular and unencrypted HTTP connection of the web sites. If you are using Chrome or Firefox browsers then HTTPS Everywhere can use a series of specially designed codes to redirect your browser through the secure HTTPS connection of the website. HTTPS Everywhere uses a large number of predefined redirection rules that can function for a wide variety of popular web sites. 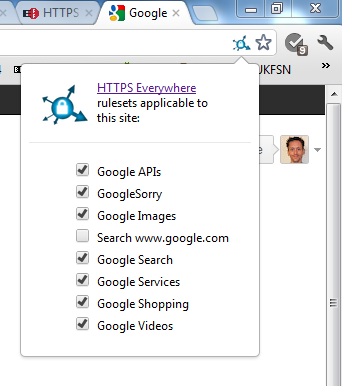 Moreover you can also define your own rules by creating ‘rulesets’ to add functionality for your favorite web sites. You may need to use hit & trial method with use of XML files for getting better support, but don’t worry its easy enough to configure and you will love it after you get familiar with this extension. HTTPS Everywhere at present supports only Google Chrome and Mozilla’s Firefox browsers. Firefox extension of HTTPS Everywhere is a stable version but the Chrome version is still in its beta stage. HTTPS Everywhere is not a powerful internet security suite which can provide perfect security throughout the web, but its a useful additional protective layer that seems to work well and will improve over new versions in future. Personally I would recommend this extension for all internet users to get some extra security and privacy over the world wide web.